Twitter through some of us for a loop (pardon the pun) at the end of October, by announcing the closure of Vine, its 6-second video app. This is big news whether you loved and/or were involved with Vine or not. Twitter is now refocusing, and we can’t wait to see what that looks like. In the meantime, social media marketers who have made an investment in the app now need to take serious steps in another direction. If the Vine stars we knew, loved and laughed at can move on, then you can, too. 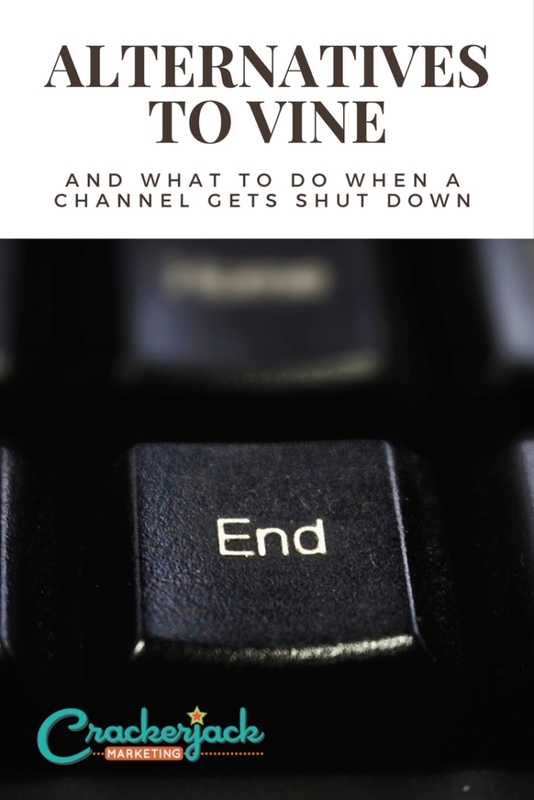 This is a great time for you to revisit your social media strategy to make sure that you have a backup plan if you used Vine, and to make sure the rest of your channels are covered in case one of them bites the dust. If you have to say goodbye to Vine, wipe your tears and start looking at other channels. You don’t have to look far; you just have to look at what works best for you and your brand. Snapchat is at the top of the list, and rightfully so. This app is certainly a challenge seeing as they don’t have a follower count or a follower recommendation feature, however, its popularity and 150 million users makes it the app you want to be on. The audience is large, and the demographics mostly include millennials, so how can your brand get started and maintain usage on Snapchat? Interact either directly through stories and chatting, or through special features and advertising! Just like Vine, you can download your stories, so you don’t lose them after 24 hours. Maybe. Snapchat mainly reaches millennials, so if you also want to reach that age group of 18 – 24 year-olds, then you need to be on Snapchat. If you’re not sure, keep an eye out. If you’re not using it now, you might be in the future. Instagram has also jumped on the stories train, so if Snapchat doesn’t work for you, try Instagram (or both!). The one-up Instagram has on Snapchat is its users base: 500 million. You’ll find a wider range of demographics on Instagram. If cosmetics is part of your goal, Instagram stories look better because of the higher image quality, but they load slower causing people to stop viewing after the 1st or 2nd story. If you’re a brand, the load time is crucial. You will also find ads and private messaging as a viable interaction tool. Yes! Or maybe. Again, it depends on your goals and your audience. If you’re already on Instagram, why not give it a try? Compare and contrast with Snapchat to get the best look for your brand. Vine might not have been live, but live video is certainly taking over the social world. If you’re considering going live with your posts (and still being able to keep them for later) start with Facebook. They’re adding more Snapchat-esque features like masks (or filters) in addition to enhancing the appearance of their video feature and giving their videos a more interactive feel. Live video gives you the permission to be authentically you without editing. Give a tour, stream an event or an opening; show off a product or a demonstration of one. As people react to your stream, comment back to them! Ads haven’t made their way into video yet, but there’s still time. Yes! Facebook is where your audience is. Let them know when you’ll be broadcasting, and you’ll have hundreds if not thousands of eyes on you. That’s great advertising! My sage advice before you “go live” is this: think before you do. Make sure you have a plan beforehand, so people aren’t watching you bop around aimlessly. Twitter hasn’t gotten rid of all of its video sources. Periscope is still kicking and still growing. Even though broadcasts disappear after 24 hours, it’s the latest and greatest for real-time marketing. One of the noteworthy aspects of using Periscope for live video is that it’s not limited by location. Your users can find you from anywhere in the world to see what you’re seeing. Maybe, probably yes. I’d like to repeat what I said for Snapchat: if you’re not using it now, you might be in the future. Usually the phrase, “everyone is doing it” isn’t the most positive of points, but when it comes to social trends, I live by it. Everyone is on Periscope, so you should be, too. Picture this: It’s 2008 and MySpace has been taken over by Facebook. How many of you hung on for dear life until the last possible second before reluctantly switching over to Facebook? So did I. Change can be hard and the opposite of fun, especially if you’ve invested time, money, energy, and strategy into a social channel just to lose it. My challenge to you is not to think of it as a loss, but a breath of fresh air to your strategy. This is easier said than done because losing a social network can feel a lot like being dumped, can’t it? Sometimes it’s unexpected and leaves us with more questions than answers (especially when you find out you’ve been ‘broken up with’ by reading an article on the internet. Yikes!). If Vine could talk it would be saying, “It’s not you, it’s me.” And it’s true. Go back to the drawing board to make the necessary adjustments in your strategy. Make sure you know how to move your content from one network to another. Download and save as much as you can to make it shareable on the other existing channels. Chalk it up to experience, brush the dust off, and move on. 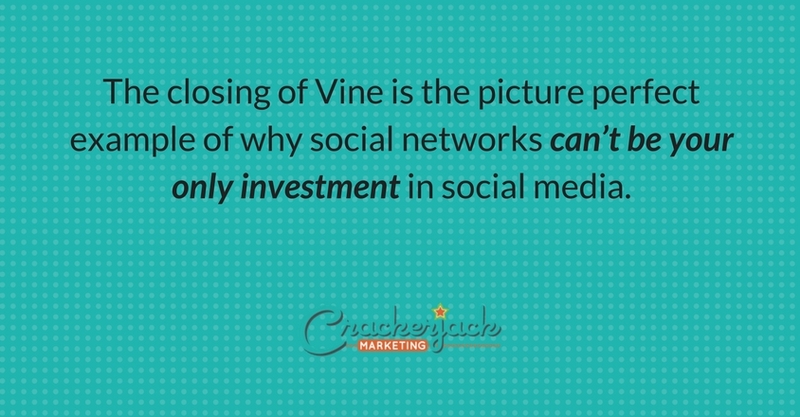 The closing of Vine is the picture perfect example of why social networks can’t be your only investment in social media. You’re borrowing someone else’s space, and it could go away in a second. Your owned space is your blog, and social media should be adding to that space, not vice versa. Keep that in mind and from now on you have a safety plan in place to protect your content and make a smooth transition whether a channel closes, or you have to leave one yourself. 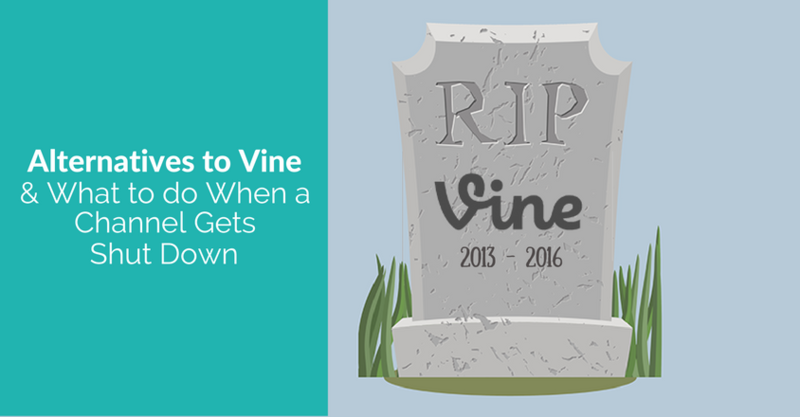 Vine is a great loss to many social media users and managers. If you were active on Vine, grab your videos and remember them in a positive light! Then, create a new strategy in case of emergencies and keep researching. Start looking into Snapchat, Instagram, Facebook, and Periscope as a place your videos can call home. Thankfully, there are many options (and more to come) as apps grow, evolve, and new ones are added! Were you on Vine? If so, where are you moving to next? Does your social media strategy include an emergency plan in case of a shutdown? Let us know!